Lead the evolution of the Tenderloin into a vibrant community for ALL. This year, we are calling on District Property Owners to vote to renew the TLCBD and carry this investment in the Tenderloin into the future. Since 2016, TLCBD has leveraged the assessment into an addition $2.76 Million in public and private funds for the District. Vote to keep your TLCBD working far into the future. On this page you’ll find updates and pertinent information for the renewal process which is underway. 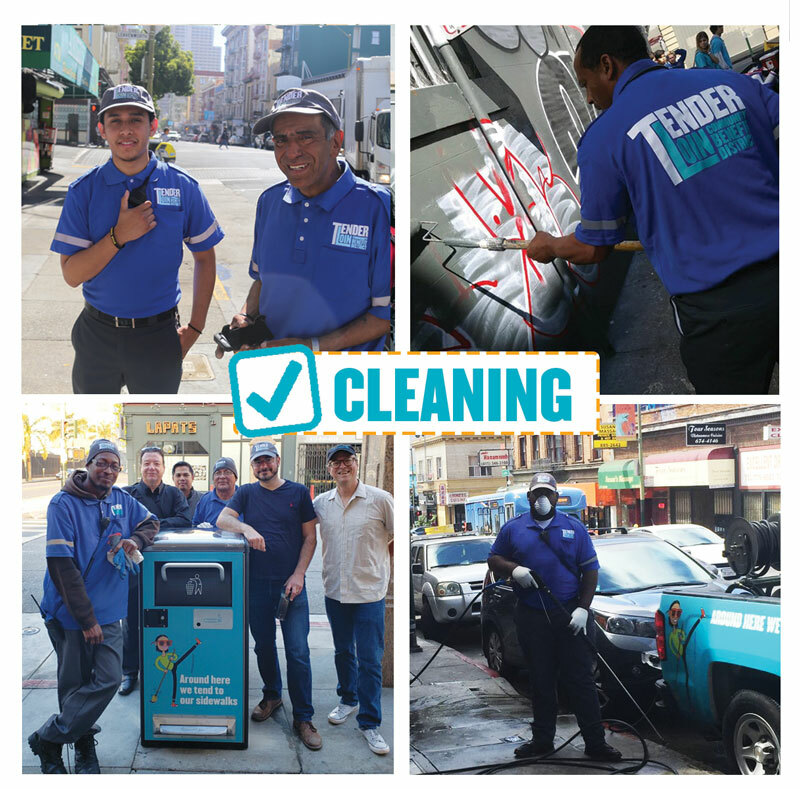 sCROLL DOWN TO SEE the ways we’re working for a cleaner, safer, more vibrant Tenderloin. What is a CBD? | How is the CBD funded? | How long has the Tenderloin had a CBD? | Who decides on the formation of the CBD? How does the CBD get renewed and how long is it renewed for? | What are the current TLCBD boundaries, and how will it change after renewal? | How does the CBD get renewed? | What if the CBD does not get renewed? | If the CBD is renewed, can I opt out? | Who will manage the CBD? What is the Petition Phase? | What is the Ballot Phase? | How do I vote? | What if I haven’t received my petition? | Who can vote? | WHY should I vote Yes, should I pay the CBD for these services? | Shouldn’t the city provide them? In May of 2017, TLCBD revamped the neighborhood sidewalk cleaning program. Additional cleaning by Downtown Streets Team, a workforce development model which has been recognized as a regional best practice to end homelessness. Proactively worked to coordinate and improve baseline services from City partners through TLCBD’s Public Right of Way committee. Partners include Public Works, FIx It Team, Recology, Public Health, and more. Successfully advocated for additional trash cans for the District, including 5 Big Belly smart solar cans. Camera network provides seamless access to SFPD, eliminating site visits at camera locations. Ongoing network expansion, including 16 new cameras totaling 36 additional views in 2018. Providing safety for 100’s of neighborhood youth each day. Public space activation efforts to reclaim the Turk Hyde Mini Park for positive and healthy activity five days a week. Turk Hyde Mini Park program has provided weekly programming with 9 partner organizations, bringing healthy activities including arts, wellness, mediation, education, workshops, and performance. To date, the park activation has served 1719 youth, 1151 adults, an 441 seniors with a safe and clean experience at the Turk Hyde park. In March 2017, TLCBD leased a ground floor office space, activating a vacant storefront while strengthening our connection to the community. Come on by! Launched Tenderloin Talk e-newsletter reaching over 1000 subscribers twice a month with Tenderloin news, arts, events, and more. Launched Tenderloin Talk LIVE quarterly event series, bridging community connection, raising community voice, and further influencing programs. We continue to be a powerful voice in advocating for the needs and interests of the neighborhood. Safer Taylor Street, lead a robust community input process, ensuring the neighborhood stakeholders are heard and implemented. Launched the Tenderloin Wellness Trail initiative to improve access and usability between neighborhood open spaces. Anchor partner in organizing the Tenderloin Mayoral Forum, 400 attendees called on mayoral hopefuls to prioritize the Tenderloin, and to directly commit to addressing issues of the Tenderloin. Check out a video, photos, and audio of the event here. Successfully advocating for more equitable distribution of City resources with partners including DPW, SFPD, Fix It, SF OEWD and more. Joined the Clean Safe 365 Coalition to address cleanliness and safety. While taking a seat at the table with other coalition members. Read our statement on why we’re joining and how the Tenderloin must be a priority. A Community Benefit District (CBD) is a formally recognized assessment district managed by a non-profit organization dedicated to improving the quality of life in a defined region. Typical CBD services include sidewalk cleaning, trash removal, safety ambassador patrols, beautification, and advocacy for policies and projects that will benefit the CBD’s district. The services provided by CBD's supplement services provided by the City. How is the CBD funded? The CBD is funded through special assessments collected from property owners within the defined boundaries of the district. How long has the Tenderloin had a CBD? The TLCBD was established in 2005.
Who decides on the formation of the CBD? Property owners within the proposed boundaries decide whether or not a CBD is formed. Looking for more information? Contact Simon Bertrang at simon@tlcbd.org. What are the boundaries of the current TLCBD? Here is a look at the current TLCBD district, as well as the proposed boundaries following renewal. Why does the CBD need to be renewed? If the CBD is not renewed, services will be terminated per City ordinance. CBDs operate on a designated life. The current life cycle of the TLCBD ends December 31, 2020. In the last year of the CBD’s lifecycle, the CBD’s stakeholders decide whether or not the CBD should go through the renewal process, which enables the organization to continue providing services. The TLCBD Board has decided to renew a year early due to changes in neighborhood issues. How long is the CBD renewing for? The term for renewal has not been decided as of yet, but a CBD can be renewed for as long as 15 years. How does the CBD get renewed? The CBD is renewed in two steps: petitions and ballots. What if the CBD does not get renewed? All CBD services will be terminated on December 31, 2020. If the CBD is renewed, can I opt out? No, the CBD assessment is mandatory. Who will manage the CBD? The TLCBD is managed by a 15-member Board of Directors, who are elected into office by fellow property owners, residents, and business owners in the District boundaries. The Board holds regular, public meetings. What is the Petition Phase? All property owners within the proposed CBD boundaries will receive a petition package in November of 2018. The CBD must receive petitions in-favor of renewing the CBD from property owners representing 30.1% of the total assessment to be paid. What is the Ballot Phase? All property owners within the proposed CBD boundaries will receive a ballot in the mail. For the CBD to renew, a majority of ballots must be cast in favor of the CBD, weighted by assessment to be paid. Petitions and ballots are sent to the mailing address on record with the County Assessor’s office. What if I have not received my petition? If you do not receive your petition by January 1st, 2019 please contact simon@tlcbd.org. Only the property owner or legal representative of the property owner is allowed to vote. Increased focus on government advocacy for safety, transit, homelessness, etc. Why should I pay the CBD for these services? Shouldn’t the city provide them? CBDs do not replace City services. CBDs provide services above and beyond what the City offers. CBDs provide consistent clean and safety services and marketing and promotion services that the City does not provide. Additional services provided include: trash removal from sidewalks, pressure washing, additional graffiti removal, public safety programs, public space activation, marketing, advocacy, event programming, etc.